Summary: The Irish current affairs monthly “Village” published a short piece about the EPO in the print edition of its November issue. The text of the article reads as follows. Accusations of autocratic power, breach of the rule of law and suppression of the staff union are circulating in the normally serene Munich-based European Patent Office (EPO) which employs 7000 people and decides whether a company is to be granted a monopoly on its inventions in as many as 38 European countries. 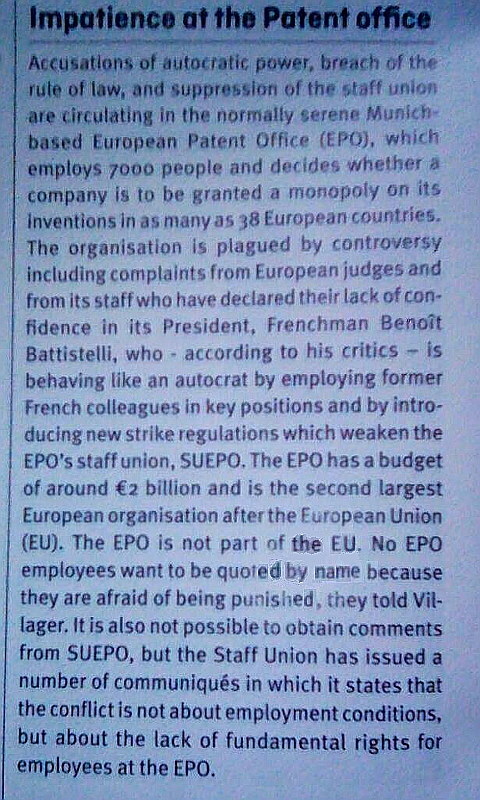 The organisation is plagued by controversy including complaints from European judges and from its staff who have declared their lack of confidence in its President, Frenchman Benoit Battistelli, who – according to his critics – is behaving like an autocrat by employing former French colleagues in key positions and by introducing new strike regulations which weaken the EPO’s staff union, SUEPO. The EPO has a budget of around EUR 2 billion and is the second largest European organisation after the European Union (EU). The EPO is not part of the EU. No EPO employees want to be quoted by name because they are afraid of being punished, they told Villager. lt is also not possible to obtain comments from SUEPO, but the Staff Union has issued a number of communiques in which it states that the conflict is not about employment conditions but about the lack of fundamental rights for employees at the EPO.